NPS just came out with an estimate of how large the March 28 Ahwiyah Point rockfall was, and I was surprised to learn that it was nearly 50% larger than the major rockfall in 1996 that fell near Happy Isles. Turns out, there has been a really interesting conversation going on over at Supertopo about the rockfall, and I picked up some more interesting information as well, and would recommend that as a good source for pictures and analysis about where the rockfall came from. Yesterday, the National Weather Service was calling for a winter weather advisory in effect starting at 6pm, and it started to rain, hard, at my office in the Valley about 5:45pm. 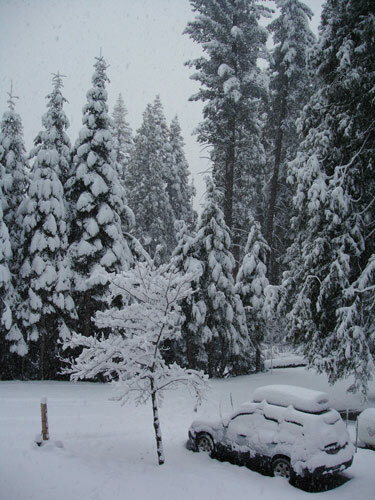 When I drove up to the house from work, the snow level was right at the Wawona Tunnel. I drove in one end in the middle of the spring rain, and came out the other end in a winter blizzard. It was a bit Alice in Wonderland, and completely delightful. MM, who came for dinner last night, says that it seems like that happens a lot – the rain snow transition in the tunnel – and we tried to figure out why that would be. Nothing we came up with seems particularly plausible. Probably Magic. This morning there was about 5-6 inches of snow on the ground at our house, and of course, before we could get out of the driveway the plow came by and buried us in a good deal more. Fortunately, I have an excellent snow removal service – Tom + shovel, and we were able to get out with a bit of slipping and sliding but nothing major. Back in the Valley this morning, the big features were all lost in the clouds, but I thought the patches of green grass surrounded with snow were particularly striking.